Vermont…The Green Mountain State is VERY greenish, emerald looking right now (like a cool rainforest without too many dangerous critters!). 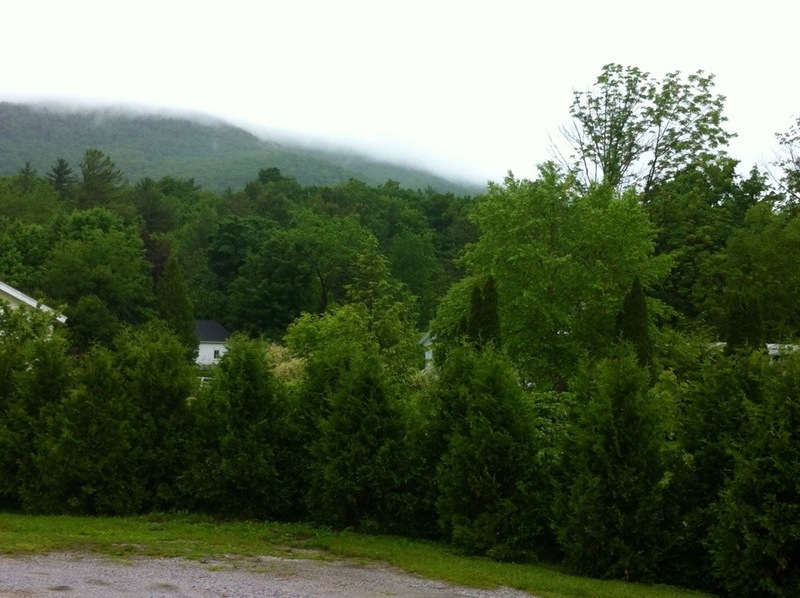 The picture I took is from my front porch and shows much of the rainy, temperate weather we’ve been having lately (yes, we lit another fire in our wood stove last night on June 11th!). And…yes, naturally, as the school year ends, we want to be outside ready to enjoy summertime barbecues, but instead we are inside as though winter is stilling dwelling in our midst. The crazy weather can only make me think of the seasons of our soul. When it’s winter we want spring or summer or even autumn for that matter. Anything is better than winter most people would agree, unless you’re an avid skier or snowboarder. I do enjoy winter myself and love to ski, but I prefer summer. The seasons go round and round almost too quickly, and so do the emotions and seasons of our soul. Life events can put on a smile on our face and make us jubilant, or stress and sickness can creep in and make us feel glum. No matter what, life is always changing. We can’t stop it, but we can reflect upon it. Right now our house is quiet. Our exchange students have all gone home, and we miss them. It’s a bit of winter in the souls of our family and reflects the weather quite well at the moment. Soon we WILL experience warmer, too-hot-to-be-barefoot summer days (at least we keep telling ourselves that) where the lake or air conditioning will be the popular place to be. Our souls will have the rest it needs. Then in the Autumn when the school year begins again and our home is filled with bright, smiling new students, we’ll look forward to the next season in the weather and our souls. How about you? How does the weather sometimes mirror the season of your soul? This entry was posted in Uncategorized and tagged photos, seasons, soul, summer. Bookmark the permalink. Sorry to hear that. We absolutely can’t wait for some warmer weather!